grass stains: Ladling punch at 6 a.m.
Ladling punch at 6 a.m. I hadn't given any thought to the time of day I was Tweeting my random thought; I always just Tweet as the thought strikes me. So I had to issue a clarification. And while doing so, I was wondering how I could have made my thought clearer ... Is there another word for "shower"? "Shower bath"? Apparently the main issue was the time of day I sent the Tweet. Rest assured, I do not have punch OR a ladle in my shower. Nor do I keep alcohol in there. I WAS glad it made people laugh, though. Sidebar in the form of a Fun Fact about Hilary: I don't know Hilary in real life. I randomly connected with her on Twitter a couple of months ago when I was reading through Tweets with the hashtag #CougarTown. She'd asked if someone knew the name of the song that played at a specific point in the episode that had aired that night, and I answered her. Her profile said that she lives on an Air Force base to which a friend of mine just moved, so I introduced myself and we had a few kind words. We began following each other, and then lo and behold, she Tweeted something a few weeks later about Anton, one of the EB babies I follow because of Jonah. And I Tweeted to ask her how she knows about Anton, and it turns out that she has read Patrice's blog since Jonah was born. Talk about a small world! I nearly died. Of the millions of people on Twitter, I connected with someone who follows Jonah's story when I followed a hashtag for 10 minutes for the first time. And all the puzzle pieces just fell into place. Amazing! At any rate, now we interact regularly on Twitter. And just to be clear about this: "ladling my punch" wasn't a euphemism for anything, as my dirtier-minded friends assumed. Although we've all had fun over the last week saying things like, "Well, I hope your punch gets ladled tonight" and "I'm off to ladle my punch!" Because we're ridiculous. WIthout a doubt, it was the 6 a.m. that threw everyone off. Generally a time that you TAKE a shower, not GIVE a shower. Funny stuff! Katherine, you crack me up with your tweets. I long to be your friend irl or just sit next to you in a cubicle at work! I am not a stalker, just another weird person. And I mean that in the nicest way possible! What does it say when I totally got the ladling punch scenario? 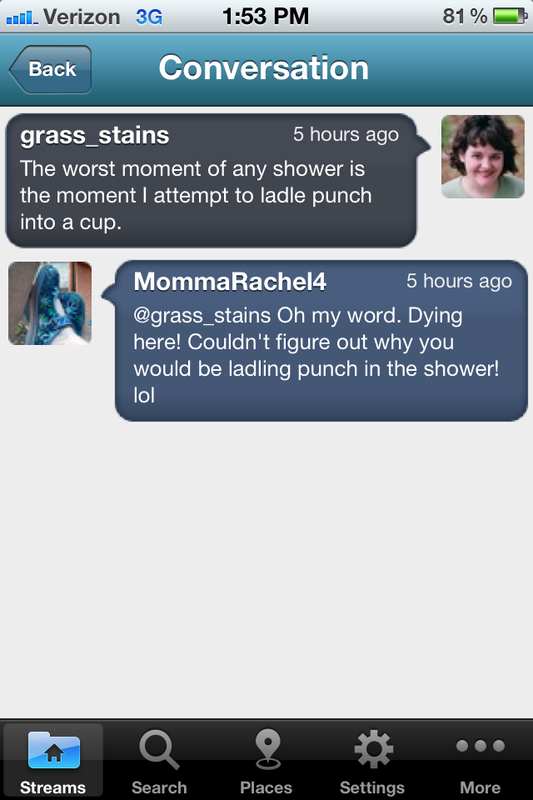 Guess I (a) have given way too many party showers; (b) I am a klutz when it comes to ladling. Spot on with your guess of me being 4 in that pic. However to answer your question (that was not in any way, shape or form a question) I am 23. I like how you emphasise the fact I'm British. Clearly my defining factor. I never jumped in on this convo, I thought you were having a shower, as in baby or bridal, at work with co-workers. Never crossed my min you might not do that at 6:00 am. OMG - I missed this tweet. You are hilarious! Oh my goodness....I'm on your blog! I've totally arrived now. lol. I was so confused that morning and couldn't stop laughing once you explained. hehe.